Are you an experienced project manager looking to sharpen your skills and advance within your profession? 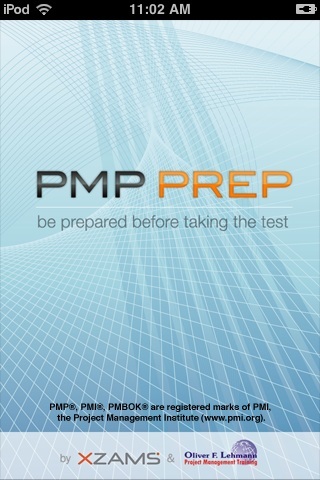 Prepare to become a certified Project Management Professional (PMP) with the newest XZAMS test-prep application for your iPhone or iPod Touch. 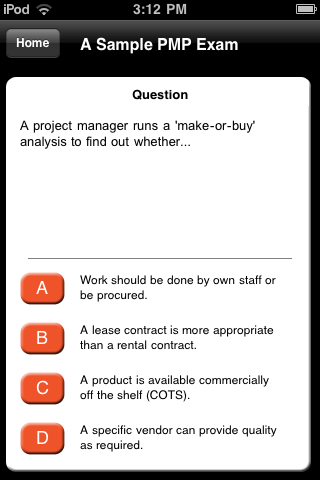 The XZAMS PMP app helps busy project managers study for the PMP exam administered by the Project Management Institute (PMI). 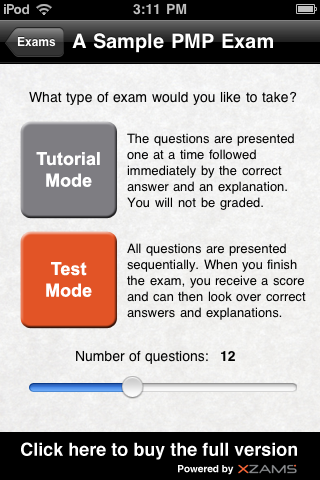 With over 400 test questions, answers and detailed explanations — all provided by certified PMP professionals and trainers — the XZAMS PMP app will help you attain a credential that is industry-recognized as a sign of excellence and competency in the project management field. · Over 400 Project Management Professional test questions, answers and detailed explanations. users can see their score and what they answers got right and wrong. · Additional 100 questions added. 500+ questions, answers and explanations now available. · Updated questions to reflect latest, revised PMP exam.